Can you trust your solar modules supplier? At the beginning of June, DNV-GL released its PV Module Reliability Scorecard report 2017 where the company shares the results of extended quality tests performed on a large selection of modules manufacturers, while PV Magazine organized its 5th Quality Roundtable during the last Intersolar Europe. Those two separated events raised common insights related to solar modules quality issues. Which leads us to ask you the question: can you trust your module supplier? DNV-GL is known for its Product Qualification Program. One of its aims is to provide PV equipment buyers and PV power plant investors with independent and consistent reliability and performance data to help implement an effective supplier management process. In early June, the company released its latest report highlighting the results of a panel of manufacturers submitted to extended quality tests. At the same time, during Intersolar Europe, PV Magazine gathered PV professionals to exchange around the mitigation of risks through the system lifecycle. As far as solar modules quality is concerned, both events brought interesting arguments on the table and raised the same issue, namely that in 2017, the quality of solar modules is still a very important topic. The report from DNV-GL reminds that out of the 300 GWp worldwide capacity, almost 80% has been installed in the last 5 years, giving only a limited visibility on reliability. During this period, price pressure has been strong and manufacturer’s supply chain got more complex to tackle cost reduction and local trade measures. So the concerns over quality are legitimate. Stephan Padlewski, Regional Marketing Manager at Dupont Photovoltaic Solutions, featured in the wrap-up video (at 1.20 min) published by PV Magazine, underlines that field reviews performed by his company showed early stage degradation on a significant share of modules. The report from DNV-GL can be read here but we would like to share with you its 4 take-aways as we have been ourselves advocating for years in the same direction. The choice of components. This is where everything starts. If great components are selected, then greatness is achievable. But from poor components, only mediocrity can be expected. 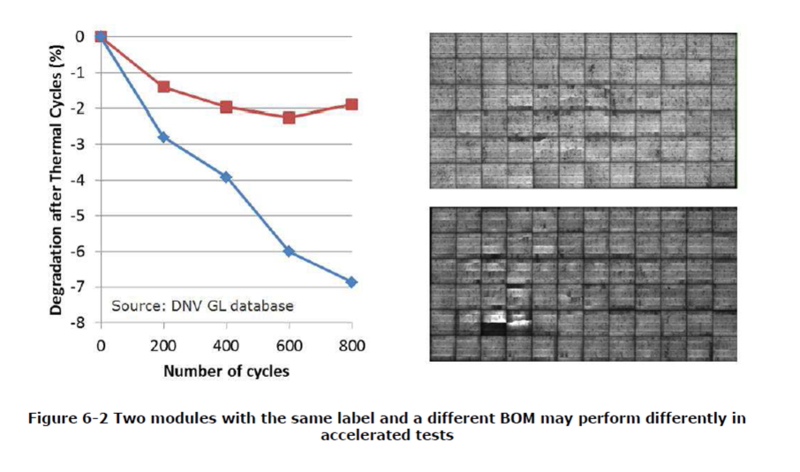 The figure hereunder extracted from the DNV-GL report shows how the behavior of two modules with the same power class but with different BOM can vary greatly during quality tests putting at risk the financial profitability and in the long term the safety of the system. At some point, the price factors in this aspect and you get what you paid for. Stating the importance of the Bill of Materials, it is important to remind that IEC certifications are not a very reliable tool to evaluate product quality as the modules sent for testing do not necessarily reflect commercially available products. The myth that all modules are equal often comes together with the belief that location does not matter. Meanwhile, the study of DNV-GL shows that it is not the case and that a similar Bill Of Materials used in different locations does not give the same results. Here again, we are talking about the know-how necessary to run a production site and it can vary depending on the location and the people. This statement is further reinforced by the data and experience shared by Clean Energy Associates during PV Magazine’s Intersolar event. Based on on-site Quality Assurance done since 2008 and covering 9 GW of systems, it confirms that for a same manufacturer, performances can vary depending on location and ownership (own lines vs OEM). This point is directly related to the previous one. Supplying modules from a large manufacturer is not a guarantee of quality as those manufacturers generally handle a complex supply chain with multiple BOM, location and OEM suppliers. It is the least we can say. After all, behind the products are humans with their qualities and imperfections. But the values a manufacturer lives by, beyond the simple marketing statement, is of utmost importance when it comes to the quality of solar modules. When dealing with the quality issues illustrated by the DNV-GL study and PV Magazine’s Quality Roundtable, one striking conclusion is immediately perceptible. When talking about the means to mitigate the risks, it is obvious that it is only doable by EPCs/developers…Who could afford otherwise to send people supervise the production, test production batches…DNV-GL concludes its report with the following statement: “We do not recommend relying solely on the volume shipment or reputation of the manufacturer for procurement decisions.” So what should be said to the millions of homeowners across the globe who trust solar energy to be the reliable energy source of the future? That they cannot trust their supplier? It is real pity for our industry. Beyond mere marketing statements of the vast majority claiming to be leaders in quality, the truth is that a random citizen seeking to go solar has only a few choices of companies who gained the status of brand. Because being a brand means delivering its promises and being trustworthy. Otherwise it is just a label on a product. And we find a lot of labels in our business. There is a second challenge at stake. It is the one related to guarantees. Because quality does not stop to the product, the quality of the customer relationship which comprises the execution of the guarantees matters as well. The DNV-GL study ranks S-Energy as a top performer while the company faces difficulties with claims in Germany. So one should adopt an holistic approach towards quality to make our industry really trustworthy. There is a long way to go and the market has its responsibility to walk the talk to select the right manufacturers and pay the right price for high quality modules which are the only one able to secure safety and profitability of PV systems. Finding companies ranking high on each of those items is a challenge today in our industry, reason why the true quality, not the one hidden behind a product label, a production ranking or whatever commercial argument, but the one repeatedly delivered on the field is priceless.